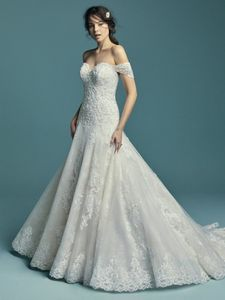 Description: This lovely A-line wedding dress features layers of tulle, Chantilly lace, and lace motifs. Beaded lace motifs adorn the bodice, featuring a strapless sweetheart neckline and subtle V-back. Finished with corset closure, with option of a half modesty panel (finishes at natural waistline) or full modesty panel beneath the closure. Also available with covered buttons over zipper and inner corset closure. Illusion cap-sleeves accented in lace motifs can be worn on or off the shoulder, sold separately.